Released in January 2010 by BioWare, Mass Effect 2 is the second game in the Mass Effect trilogy and the sequel to Mass Effect, where you take control of the mysteriously gender neutral Commander Shepard, given a ship by a famous pro-human terrorist group called Cerberus and tasked with finding out why aliens keep killing humans. Also, you get into a conversation with an alien where they say they are the proud commander of the Qwib Qwib. Qwib Qwib. Yep. Best time on Casual difficulty: Single-segment 2:02:15 by Dustin 'Hokorippoi' Hanks on 2013-03-31. Best New Game+ time with DLC on Casual difficulty: Single-segment 1:32:28 by 'letterswords' on 2014-02-08. Single-segment Casual difficulty: 2:02:15 by Dustin Hanks. This is my: Mass Effect 2, Single-Segment, Casual Difficulty, No DLC, Any% run. Playing off 'Your Name Here' comments for his Mass Effect 1 run. 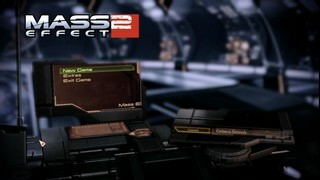 Mass Effect 2 continues the story of John Mass Effect, Zombie Captain of the USS Normandy 2. Evil robots are still coming. Not wanting to deal with John after what happend last time, they kill him in the 1st 9 mins. Too bad they did not know of Zombie tech! John is back as a Vanguard of THEIR destruction. Evil Zombies vs. Evil Robots. Who ever wins, all life lose. I over estimated the time it takes. So when I started I was like "under 3:30 easy". Then I move down to 2:40, 2:30, 2:25. Now this run is ~2:20. Pick and run 2 Missions/Assignments. Pick and run 2 more Missions/assignments. Do the final mission by way of the Omega relay, and blow up a Human Reaper. You don't need to blow yourself up to Storm (That is was Sprinting is called). The Vanguard class, with its ability to Charge (jump to) targets. * All the bugs that come with this. So, luck alone would improve this run a lot. That along with mistakes, this run can be beating by maybe 4-5 mins. What way? - John some time likes to pick how he thinks your controls should point him. I push left, he goes right. This happens a lot after cutscenes, or charges. If I wait 1-2 secs the controls would be normal, but I just wish luck and hope that he moves where I want him. No Charge - You as a Vanguard try to charge, John does not charge. Fail Charge - You as a Vanguard try to charge, John Charges but does not move. A cooldown is started, but you don't get any of the good effects of a Vanguard Charge (Shield, Damage to Enemies, and movement). NPC Ignore you - You click on NPC, NPC does not start their Cutscene/Dialog. The only way around this is to reload the last save. Wrong way John - If you get hit while Charging, some times john will not let himself turn. You can look around, but John will only point at one place. Sometimes You can't even move him. RNG spawns/despawns - Based on how fast you get to places, and how much of a toll the game wants to be, people will spawn or not spawn. Vanguard needs people to charege to, so people not spawning can cost time too. Barrier be Gone - In the final mission, the person who is tasked with keeping a barrier up, teleports away. You die. Did Fine. Some time the game lets you turn the corner without having to stop storming, this time it did not. I was on the edge of restarting, but the time was okay. Has a fail Charge near the start. Miss fired M-100 Grenade Launcher - costing me 1 shot. I got two Charge that normal become No Charges or Fail Charges. Maybe could save 5 secs and 1 shot of the M-100. This was okay. I don't do well at fighting. Lost ~20 sec over my Personal best for this Mission. Grabbed a upgrade that increase the speed of Storming by +10%. Can't put it on yet. I will when I get back to the ship. I got good timing on the dialog. On the 1st locked door, one group of spawns before the door unlocked. This door can spawn none or up to 3-4 groups. Some guys did not spawn in the end. That cost me 5-10 secs of walking. I start out by putting on the speed shoes and the armor mask thing everyone can put on. I talked clicked too fast, so had to talk to her a 2nd time to start the mission. I hack the Mech, it cost little time. Could save time in killing things. Tried to open door to fast. This cost me. I was able to get one of my Squad mates to teleport to me. Normal I have to wait for them to walk down there. The 2nd fight, with the Mech did not go well. I like if by the time the Mech turns on me, only the boss guy is left. I also like to leave my squad mates to kill the boss, while I head back for the next part. The guys in the left door area died too fast, so I had less people to Charge to. The right door is the only one that has something that can interop it closing: a dog. The next fight went well. One fail charge. The upstairs fight went good also, but the down stairs went bad. I normally don't have more than one guy alive after the 1st 3 die. The Airship died in one window. That is good. Was able to get a lot of charges that normally don't work. Grabbed Damage Protection. Won't be able to use it for a long time. Did not have the best Mech fight. The 2nd Mech normal hits me with Rockets. Him not doing it saved 2-3 secs. Had to waste a few shots on the final guy. Got a lot of Charges. The 1st group spawned, so I did not lose time having to walk there. The clearing fight before talking to the trash Korgon went well. A lot of good Charges. The final fight went great. Missed a few shots. The girl went down fast; the Mech took a little whie, but a Korgon line him self up nice for a charge that samed a few secs. I was not able to fully skip any of the hacking fights. That can same time, but should only really see all 3 in a segmented run. I do try. They can save a lot of time. FInal fight went okay. The big bug fight went well. I was able to kill him without him moving much. The NPC bug did not happen on Omaga, or here. This makes the run very nice. I got nocked around by Bionics a lot more then I like, but the fact I did not have the bug, and everyone I needed to spawn; spawned, made me happy with this part. I buy star maps for missions later. You can note that one of the maps I don't use. That is a 'oh shoot I forgot to pick up the needed minerals' mission. The 1st fight goes well. I only be faster a few times. Last time I used a pistal, this time I pulled out all the stops in blowing it up. The final fight was okay. I failed to reload before coming in, but I was able to kill them fast. Only the 1st group spawned. This mission is a lot of 'get from point A to point B without dying'. I did not die, so it is a improvement on my other attempt. Many of the fights went better than other attempts. The hack was not easy, so I skipped it. Not that I would need the money. The area after talking to Taila has forced me to slow down. I die to much in that area. The Final fight took 2 fail Charges, I wasted 2-3 secs going for more Hevly ammo to make the mission parts coming up more easy. This Mission hates speedrunning. If you try to run in the wrong place, it will send you up into the air with no way to get down. At the end Don't ever run. You can never run along that beam. It was okay. I have had better fights, but with the time I was having at this point (-6 mins from PB), I did not want to risk a death. Ship 1, is the collector ship. This went okay. The 1st fight area went very good. The big fight in the middle did not go as well as normal. Not a lot to say - most of it is Storming/Chargeing from Point A to Point B. This is the reaper Ship. It did not go well. 1st door hacking was good. Not abnormal to get it like this, but still nice. I kept getting stuck behind the Scions (big bags of armor). I died at the next door. For a death, this was not too bad. it was the worse form of the "Wrong way John" bug. I could not move. So I died. 1st Death from bug. 2nd time around, the door was hacked fast. The Reaper core was okay. I tried the OOB bug so I could ignore the husk, but it did not work. While I was trying to finish off the core, some Husk attacked me. Only lose of time is I never changed to a lighter gun, so the game force me to pull out my Beam weapon; that takes time. Got both sides on 1st try, but had to hide behind a box to get back some shield. Does not hurt that the whole mission is walking around the ship. For people who don't know, you can skip the 'wait for them to pass' part. Took down the ball about as fast as I can. In the 1st part, I had to stop and hide. Normal I don't but with the good time I was getting, I did not want to risk it. Barrier be Gone bug happened. So I died. Nothing I can do about it. The game hates people. I was not able to destroy all the tubes in one go. So was force to fight a 2nd wave. I had really bad aim at end, and had not switched ahead of time to the beam. So cost me some time and ammo. That forced me to switch to finish off the Reaper. So it ends. A reaper killed the Zombie Lich King, John. John killed the Reaper. Single-segment New Game+ with DLC on Casual difficulty: 1:32:28 by 'letterswords'. Background: This is a New Game Plus speedrun, which uses a character that has completed Mass Effect 2 at least once. Somewhat surprisingly, the fastest way to do a NG+ speedrun is not to use a max level character. Using a glitch that involves resetting all your skill points and using advanced training upgrade to acquire dominate, and repeating, it is possible to gain a large number of extra skill points. In total, I start the run with 40, compared to about 25 that I would normally have at level 12, which is the lowest level I can have in a game completed file (this glitch is limited by finite amount of resources to spend on upgrades). This run also uses DLC. Most notably, it uses the Zaeed and Kasumi bonus squad members, which allow for around 8-10 minutes of time savings through route changes allowed. The Horizon mission does require completing all the normal recruitments from the first half of the game, but all of the recruitment missions in the second half of the game can be avoided because the Collector Ship mission requires 8 squad members recruited and 5 missions completed after Horizon. Without the DLC characters, you need to recruit at least two of Thane/Samara/Tali to trigger the mission, but with DLC characters, you can skip all three, and instead substitute them with significantly shorter N7 side missions, which also count toward the 5 mission requirement. Other DLC used in the run are the Firepower Pack, which allows access to the best weapon in the game, the Mattock assault rifle, which is pretty much the only non-heavy weapon used for most of the run. It also uses the Aegis Pack, which provides most of the set of armor I use during the run. One last note: like in most Mass Effect 1 speedruns, including the one of the runs currently on SDA, this run rebinds text skipping to the mouse wheel, which is responsible for the squeaking/buzzing sound you hear during some cutscenes and conversations. Prologue: The mission started off pretty well. The combat sequence where I first meet Jacob can be a little faster with bit of luck related to how useful Jacob makes himself. The charge following that part I get staggered on a little bit, which is a concern with all the charges on this mission. When I meet Wilson, I try to use overload to leave some mechs alive, which will get the mechs in the following room moving faster (and thus I can charge sooner), but I also get staggered there. Otherwise, the mission went fairly well. Doing this mission fast is extremely dependent on how useful your squadmates are, and they were pretty good here. I do get stuck waiting for them to trigger a door opening for a few seconds, but the remaining fights go pretty well, especially the YMIR mech at the end. Interestingly, it is better to take the last shot I have with my grenade launcher before grabbing more ammo because for some reason the ammo box gives you 4 shots when your clip is empty but 3 when it isn't. I also grab a heavy weapon ammo upgrade which will be very important later on. I grab Zaeed here to gain another squadmate, which will save me time later (as explained above). Following Zaeed, I head towards Mordin's recruitment mission, where you can see the slight negative to rebinding dialogue skips to mouse wheel. Most times, I can skip through quickly just picking the default right-middle option, but here I can't, and I accidentally pick the wrong option once trying to be careful to not exit out. The group of 3 enemies behind the wall that I charge to near the beginning of the mission has some interesting properties. Normally, a second wave of enemies can spawn and the door won't be open, but by running through the archway to the right and doubling back prevents these enemies from spawning and unlocks the door faster. I grab an assault rifle damage upgrade which is the second upgrade and last upgrade I grab during the run. The second half of the mission is all movement optimization and charge usage optimization. When going down the ramp and then running out into the fairly large room I miss a very narrow window to hit a charge and lose a few seconds. The final room with the environmental controls goes perfectly though; the main concern there is that the rooms on the side can sometimes have no enemies spawn, and thus no opportunity to charge. After the previous mission, I purchase the two upgrades I grabbed earlier. I have to talk to Aria to trigger the next mission, who has similar issues with dialogue skipping to the guy who I talk to before Mordin's mission. The waves of enemies that attack Garrus's "base" are one of the weirdest looking parts of the run. I want to first kill the mechs, and then run back into the base. This is because I want to hear Garrus say "Eclipse mercs have entered the base", which triggers a countdown to end the waves of enemies more quickly. I try to kill the last enemy of the first wave of mercenaries 30 seconds after hearing the message, but before 30 seconds pass I get the vocal trigger for the second set of enemies ("They're deploying snipers), which seems to come at an inconsistent amount of time after the first vocal trigger. This wasted about 20 seconds, but this method is still very inconsistent and it still ends sooner than it would've had I not let the enemies enter the base. The second half of this sequence (when the mech comes) has a similar mechanism. The waves end faster if you kill the mech faster. However, in the interest of getting back to Garrus ASAP, I always leave my squadmates to try to kill the final guy on their own, which can be hit or miss, and in this case, it was a miss, and wasted a bit more time. The rest of the mission went smoothly, but overall, this mission is the most difficult and random part of the run and also the biggest time loss of the run, and could probably be done ~30-40 seconds faster if everything went perfectly (which it almost never does). This mission went fairly well, and the only thing that could really have gone better was the forced fight with the YMIR mech and surrounding mercenaries. I take a little longer than I would like to kill off the mechs (and my squadmates were not helpful). The first mission where NG+ starts to have a significant advantage over NG, with the first use of the Cain right at the end of the mission. Almost every fight can be skipped, and thus I spend a lot of time running and charging around. This is definitely one of the hardest missions in the run to do quickly, and was and was the major blocking point for me in terms of getting a good run. There are two bypass sequences and one computer hack sequence which all need to be done while potentially under fire, which will interrupt the hack/bypass and force you to restart. I don't get interrupted at all, but I make a mistake on one of the bypasses and have to restart anyways. I also charge to the wrong enemy before the first bypass, which wastes a little time. You will also notice me grab the Collector Particle Beam and immediately change weapons at the next weapons locker. Picking up the Particle beam gives me full heavy weapon ammo, letting me use the Cain on the Praetorian at the end of the mission. The final fight in the square actually goes really well, and I hit the Praetorian with the Cain (which is more difficult than it may seem). I talk to Jacob to get his Loyalty mission, which gives me access to a new sector on the map where I do a mission later. I then go unfreeze Grunt and recruit Kasumi, which brings my squadmate count up to the necessary 8 total to finish the game. 1st: Wrecked Merchant Freighter: Not much to say here, other than that there is a small risk of dying to the YMIR mech that I run past at the end of the mission. 2nd: Abandoned Research Station: All I have to do here is be careful to not die in the engine room to the exhaust and memorize the little puzzles that I need to do in the other two areas. 3rd: Hahne-Kedar Facility: This mission is unlocked by finishing the Abandoned Research Station mission. I get very unlucky with the hack at the end of the level which wasted around 10 seconds compared to a fast hack. 4th : Archaeological Dig Site: This mission is what I gained access to by talking to Jacob earlier. There is an extra group that can spawn next to the door at the end of the mission, which is avoided here by not killing all the enemies in the initial room, as far as I can tell. 5th : Eclipse Smuggling Depot: Another place where the Cain makes a big difference; I kill all three YMIR mechs with a single shot. I was really pleased with how the mission went. All the forced fights went really well, although the Praetorian could have been a couple seconds faster had one of my squadmates not died. I have to be careful to have enough heavy weapon ammo at the missions conclusion (equivalent to 290 with the Particle Beam), because the biggest time saver with the Cain comes on the following mission, but I had plenty here. This mission goes way faster because of the Cain, and this is probably the biggest time-saver in NG+ relative to NG (around 3 minutes). I also skip one of the heavy weapon ammo pickups because I have enough left after the previous mission. The bypass to get into the Reaper Core got interrupted, and wasted a bit of time. It is actually possible to get into the Reaper Core room without killing the two scions by the door, but it is very risky and I don't even attempt it. 1st : Endangered Research Station= Almost entirely based on doing bypasses quickly, and I was relatively happy with how these bypasses went. 2nd : Lost Operative: I do this N7 mission last because it leaves me off in the Omega Nebula, where I want to be for the end of the game. The bypasses and combat went really quick, and all in all this was the best I've ever done on this mission. I have to play as Joker for a little here. The second deck, I can run right past all the Collectors without having to worry about getting caught. The bottom deck, I actually run in the opposite direction of what the lights tell you to because there are no Collectors in that direction, allowing me to hit the button in the engine room faster. More long cutscenes here. I could save a few seconds against the Oculus by switching to the Cain right at the end of the first Oculus fight, but I forget to do and have to do it when I regain control in the second Oculus fight. Vents: I only have to open the first and last gates here to advance the mission, so I don't hit any of the other ones. Biotic Bubble: Since my heavy weapon ammo gets set to full at each part of the mission, I equip the Collector Particle Beam because every fight here is required. At the end, I run out of the bubble to trigger the end of this sequence sooner. Final Approach and Final Boss: More fights here like the fight in the middle of the Collector Ship mission. The final boss fight has a few interesting techniques which I unfortunately failed to pull off. The injection tubes can all be destroyed in one round by having two squadmates who have abilities that can be used to blow up a tube (I use Warp and Incinerate, but a few other abilities also work). I can also kill the Reaper before he ducks down once, but it is dependent on getting the higher end of the damage range from the Cain shot (a more exact hit of the weak spot on the chest) and then quickly equipping an assault rifle to take the rest of his health down. Overall, maybe 15-20 seconds of improvement possible here. I am quite happy with the run even though there is room for improvement, it is hard to play perfectly over for close to 2 hours. I want to thank a few people as well for making this run possible: Hokorippoi, who has the NG run currently posted on SDA, who was responsible for the optimizing the vast majority of the route and ForgedPixels, a Bioware tester who told me about the strategy I use to make the waves on Garrus's mission faster and that the vents on the Collector Station only required opening the first and last vent.